Scrumptious food Saturday is a tad late this week but better late than never as they say. Scrumptious and Simply Delicious is a high quality catering company in North Yorkshire. They specialise in wedding and event catering, corporate entertaining, holiday cottage catering and private home dining. If it is to do with catering then they can get it, cook it and serve it. They have a wealth of experience in Providing First Class Catering for all. Scrumptious Creams is focused on providing high-quality cakes and customer satisfaction – They say they will do everything they can to meet your cake expectations. With a high demand for Bespoke Cakes for weddings, baby showers, birthdays and much more all with a variety of offerings to choose from, they are sure you’ll be happy working with them. They have been baking and decorating for 6 years and decided to branch out and take on the new adventure of being well known in the cake industry. Their gallery will have your mouth salivating from the first picture. Scrumptious Romanian Inspired Recipes: A complete cookbook of Romanian Dish Ideas by Anthony Boundy. This book will show you how to cook the various types of meat & vegetable stew and soups, along with other foods influenced by Romania. Many of their dishes show the impact of other European foods. 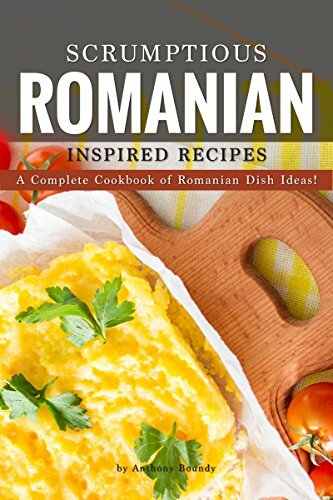 From breakfasts to lunches, dinners, side dishes and desserts, they have shared genuine Romanian recipes in this helpful book, to get you well on your way to preparing Romanian dishes right at home.